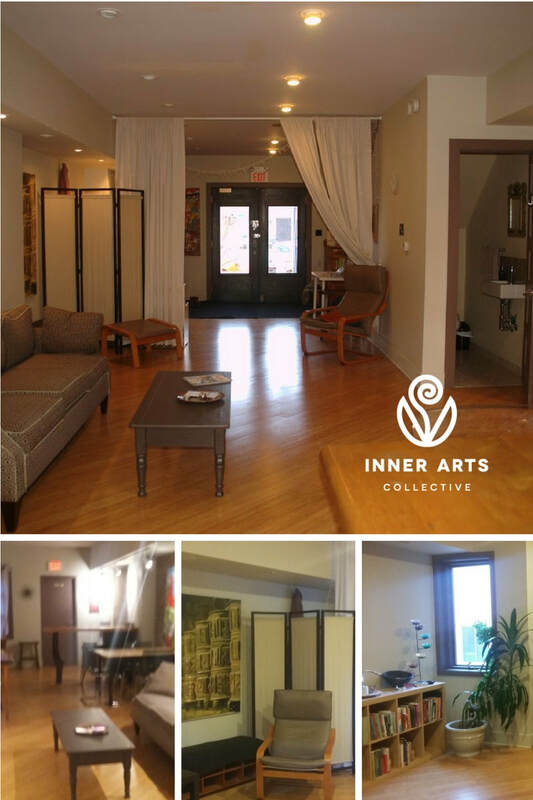 The Inner Arts Collective is located at 257 Danforth Avenue, between Broadview and Chester TTC stations. This location brings our Members so many amazing opportunities to thrive as self-development and wellness professionals. A bustling but calm neighbourhood and community dedicated to green space and healthy living. A perfect match! We also have a beautiful Sanctuary located in Rosseau Ontario, offering access to nature for healing arts practitioners and their clients, be it an overnight stay or a day-visit in the healing room and trails. For more information about the Rosseau Sanctuary, click on the button to the right. This space is a beautiful location to see your clients and offers the space to really help our community thrive, together. Monday to Friday between 10-4pm. Weekends and evenings are available upon request. All tours must be confirmed. In the fall of 2017, Restorative Landscapes worked with us to create a beautiful garden which reflects our mission and the services that we offer to the community. To begin the process, we met with Restorative Landscapes and looked at what kinds of plants would thrive in the garden, given the sun and nature of the garden beds. From there, we selected plants with energetic properties that represented our work as a healing arts community. The design was approved by our landlords, the redesign date was selected, and on November 13th we got started! The planting began with a cleansing ceremony to honour the old, and we worked to live drumming by Emre. It was an incredible time, and the resulting garden is one that will bring us beauty and incredible energy all year long! and Anton, Emre and Nadji for all your help in making this a vision a reality! Boxwood: Endurance and healing through difficult times. Butterfly Bush: New beginnings, change and transformation, creating new paths. Golden Dogwood: Boundaries, healing the body and emotions, love, and divination. Golden Elderberry: Blessings, graceful shifts and transitions, healing, intutition, and music. The Elder is also a threshold protector. Japanese Anemone: Crown and heart chakra, allowing the soul to shine through in it's divinity. Lavender: Stress reduction, calm, love, and fertility. Monarda (Bee Pollen): Peace, happiness, and restfulness. Mulberry: Comfort amid challenges, cosmic oneness, wholeness, and healing. Phlox: Promotes unity and harmony in a community or group. Penstemon: Introspection, gentle courage, and a traditional healing plant for a range of issues and illnesses. Redbud: Release of emotional pain. Serviceberry: Wide range of medicinal, craft, and food uses. Strawberry: Love, friendship, and happiness. Solomon's Seal: To support others in making difficult decisions, accepting and seeking change. Thyme: Strength and courage to promote a positive attitude through difficult times. Willow: Pain relief, connection with the moon, support in directing energy, personal empowerment. Healing and rebirth. Witch Hazel: Removal of disease and negative energy. Yarrow: Love, courage, communication, intuition, and divination. After our first year at this location on the Danforth, we have learned from the literature and our community about how to improve our use of the space. On November 6th, 2016, the IAC owners met with it's Members to share the vision for a redesign, which would increase use of our beautiful Main Floor studio, create a decompression zone at our entryway, improve access to practitioner storage, and increase access for practitioners who don't see clients to come and use the space to work on projects. Over the winter months, we transformed the main floor into a coworking lounge, and have heard from many Members how amazing it has been to use the space. Unlike other coworking spaces, which limit use of coworking lounges, the IAC provides unlimited access to the practitioner lounges. Members have appreciated having a space to come and work on their projects, and also the connections that happen between one another because of the layout. Whether people see clients within the IAC or not, the Main Floor Practitioner Lounge has become a space for all of our Members to come together.